Nobody has more Oktoberfest Costumes than Dallas Vintage Shop. Get a huge variety of Oktoberfest Costumes, Leaderhasen and Accessories. 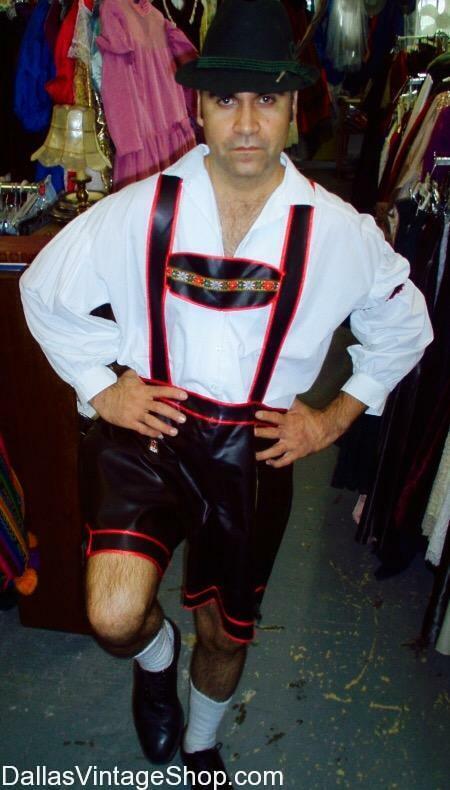 This is one of our Men’s Economy Lederhosen Costumes that we keep in stock for German Festivals, International Festivals, Theatrical, School Projects, Renaissance Festivals: designated German Themed Weekends, Wurstfest Events and Oktoberfest Celebrations. we are open all year and keep plenty of these Oktoberfest Costumes in stock. We also have Super High Quality Lederhosen and Oktoberfest Attire. Get the Bavarian, Tirolean, Alpine, Austrian or German Hats, Folk Costumes and Accessories. Pick and Choose from our ridiculously huge inventory. Get Complete Oktoberfest Outfits or just the Costume Pieces and Accessories you need.